Made of 100% natural rubber. Easy to hold. BPA- and phthalate-free. Soothes painful gums. Includes Two teethers. These charming Sofia the First wall decals will help delight any little princess. Sophie the Giraffe set of 4 nappies is an essential accessory which is very versatile and has multiple uses. Perfect for parents using prams, the nappy can be used as a security blanket, a bib or a cover for the baby in their stroller. 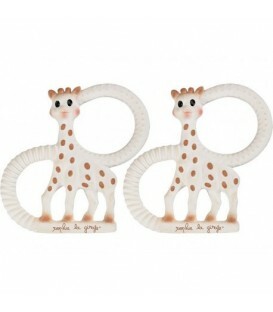 Sophie the Giraffe is one of the world's favourite baby teethers from France. Trusted by celebrities and mothers worldwide, millions of Sophies have been sold worldwide since 1961. Sophie the giraffe meal-time set contains 4 accessories in pink Kiwi the Bird design.